Looking for Leads From Your Company LinkedIn Page? LinkedIn is more than just Facebook for B2B professionals–it's a self-qualifying pool of users in your target audience that you can, and should, be using to drive leads. Like other social media platforms, LinkedIn is best utilized when there's a solid marketing strategy behind it. Content quality, type, timing and team buy-in can all play a part in your success with LinkedIn. 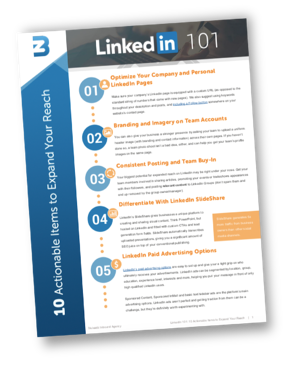 To help you make the most of LinkedIn and use it to connect with potential customers, we've created the LinkedIn 101 tipsheet. This tipsheet contains 10 actionable steps you can take to immediately increase your presence on LinkedIn.